Reports & Expert Testimony – Protect Water for Future Generations. The following links are documents or links to reports, expert testimony and lawsuit documents for your information and research. Thank you for protecting water in the Black Hills, and for future generations. CHEYENNE RIVER STUDY SHOWS ELEVATED URANIUM IN ANGOSTURA RESERVOIR Press Release…Read More. For the full CHEYENNE RIVER STUDY click here. Recent research by two South Dakota School of Mines and Technology scientists and a scientist from California State University-Fresno confirmed what we have long suspected – that elevated uranium levels are present in Angostura Reservoir in the southern Black Hills. The study tested stream sediments along the Cheyenne River watershed from old abandoned uranium mines to Angostura Reservoir. IN SITU LEACH URANIUM MINING AND WATER WHAT DO WE KNOW? This little booklet will provide you with more information about In situ leach mining (ISL). 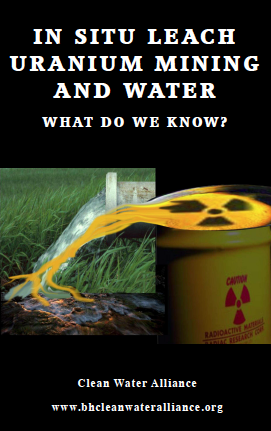 ISL will only work when a uranium deposit is located in a groundwater aquifer. Basically, water is used as a mining tool.